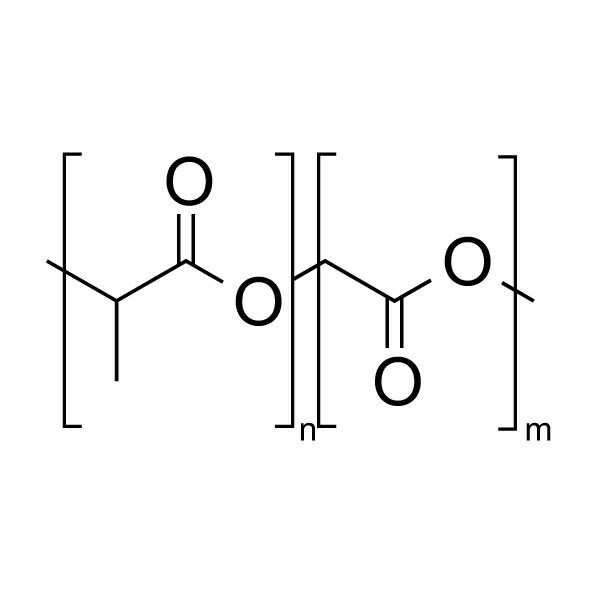 Poly(dl-lactide/glycolide) [90:10] | Polysciences, Inc.
Poly(DL-lactide-co-glycolide) (PLGA) is a well-established biodegradable polymer used in medical devices and drug delivery applications. In comparison to poly(L-lactide) (PLLA), PLGA offers control over degredation rate and reduced glass transition temperatures (by increasing glycolide content).1 The control of these properties makes PLGA especially well suited for applications where medical devices are only needed for weeks (e.g. drug delivery). 1. Middleton, John C., and Arthur J. Tipton. 2000. "Synthetic Biodegradable Polymers as Orthopedic Devices.” Biomaterials 21 (23): 2335–46. doi:10.1016/S0142-9612(00)00101-0. 2. Grayson, Amy C Richards, Insung S Choi, Betty M Tyler, Paul P Wang, Henry Brem, Michael J Cima, and Robert Langer. 2003. “Multi-Pulse Drug Delivery from a Resorbable Polymeric Microchip Device.” Nature Materials 2 (11). Nature Publishing Group: 767–72. doi:10.1038/nmat998. 3. Dawes, G J S, L E Fratila-Apachitei, K Mulia, I Apachitei, G-J Witkamp, and J Duszczyk. 2009. “Size Effect of PLGA Spheres on Drug Loading Efficiency and Release Profiles.” Journal of Materials Science: Materials in Medicine 20 (5). Springer: 1089–94. doi:10.1007/s10856-008-3666-0.